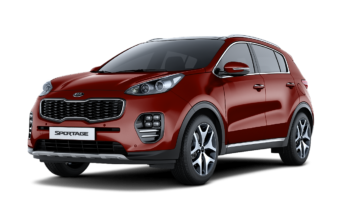 Demonstrating Kia Motors’ ongoing commitment to safety and continuous improvement, the all-new 2017 Kia Sportage has earned the highest designation possible – Top Safety Pick Plus (TSP+) – from the Insurance Institute for Highway Safety (IIHS) when equipped with optional front crash prevention. The rating reflects top scores in each of five crashworthiness tests as well as the integration of driver assistance technologies to aid in crash prevention. 1. These features are not substitutes for safe driving, and may not detect all objects surrounding vehicle. No system, no matter how advanced, can compensate for all driver error and/or driving conditions. Always drive responsibly. 2. Android™ is a trademark of Google, Inc.
3. Apple® is a registered trademark of Apple Inc.
From L-R: Mr. Gitesh Yagnik, Chief Operation Officer,Kia Motors Nigeria; Mr. Nsikak Tom, Kia Assembly Plant Engineer; Engr. Eze J Obasi, Director, Special Procurement, Bureau of Public Procurement; Mr Sandeep Malhotra, Chief Commercial Officer, Kia Motors Nigeria ; Mr Adebowale Adedokun, Head, Research, Training and Strategic Planning Department, Bureau of Public Procurement; and Mr Olawale Jimoh, Marketing Manager, Kia Motors Nigeria during a courtesy visit by the officials of BPP to Kia assembly plant in Lagos. 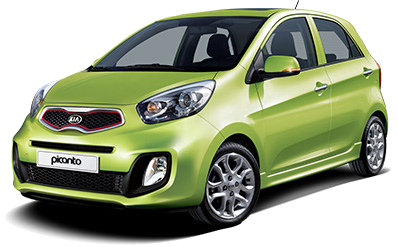 Kia’s gritty and unwavering commitment in the production of made-in-Nigeria cars has continuously been at the fore of the management of Kia Motors Nigeria. The ultra-high-tech and state of the art plant in Lagos has produced over 4500 units of cars since its launch in the first half of 2015. The trajectory growth of the locally assembled KIA cars and its top-notch quality built to the exacting standard of the global brand has galvanised the company to explore local content in its assembling chain and influenced its plan to reach a 90% local content utilisation in the production of its cars. The plant produces all 9 models in its plant, worthy of note within its foray of the made in Nigeria Kia car is the 2016 Kia Sorento. Outside Korea, the birth country of Kia, the automobile company has a long history of building locally to meet the specific needs of local customers with assembly operations using ‘car kits’ sourced locally and other parts of the world. 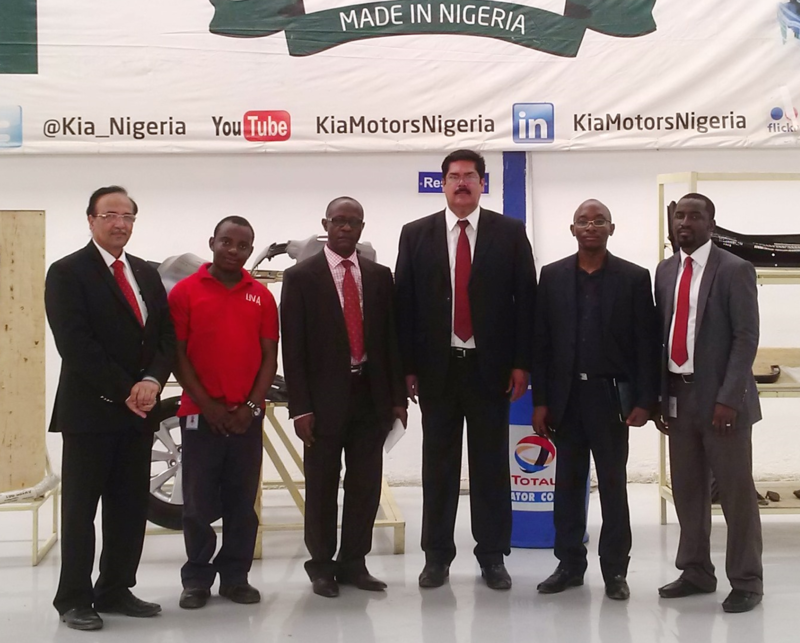 Aligning with this practice and geared towards advancing Nigeria’s economy to compete favourably among comity of Nations, Kia Motors Nigeria plans to have over 90% local content utilisation in Nigeria in its assembling process. In a statement by the Chief Commercial officer, Kia Motors Nigeria, Mr Sandeep Malhotra, “Nigeria remains an emerging and growing economy in the world with vast potentials for growth, despite its myriad of challenges the country promises a large economy of scale, hence it’s incumbent upon us as a local investor to help her realise its goals. As a company with an unswerving interest on the advancement of the nation’s economy, we have a plan to utilise 90% local content in our assembly process to help strengthen the economy. Buoyed by our increased acceptability among our valued customers in the last decade, we are now looking at further strengthening our foothold and expanding our reach in the localisation of our assembly plant”. 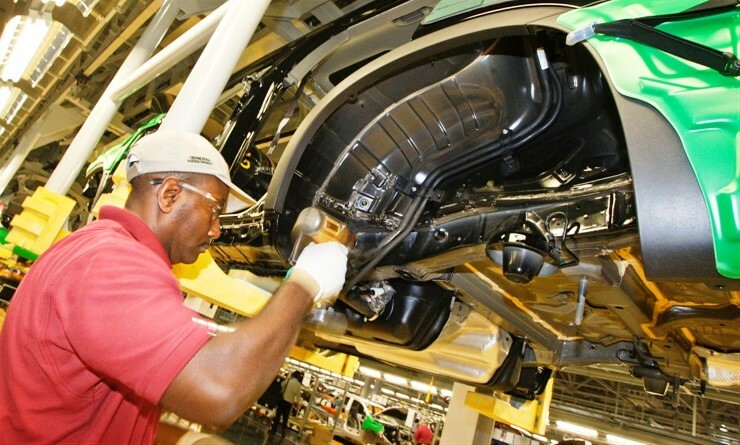 With its built-from-scratch assembly chain firmly in place and over a year of SKD production phase under its belt, Kia Motors Nigeria is now focus on the local content utilisation in its made in Nigeria Kia cars. The plant in Lagos is progressing on schedule for the utilisation of local contents in its assembling process and currently sourced some of its parts including refrigerant, lubricant, and workshop consumables amongst others locally. The plant has a capacity to build up to 27,000 vehicles annually on flexible assembly lines that can manufacture several different models simultaneously to adapt to changes in buying trends. The box car craze of the early ‘aughts has finally come to an end. Scion recently killed off its segment-defining xB, and Nissan’s Cube went away because, well, nobody bought one. 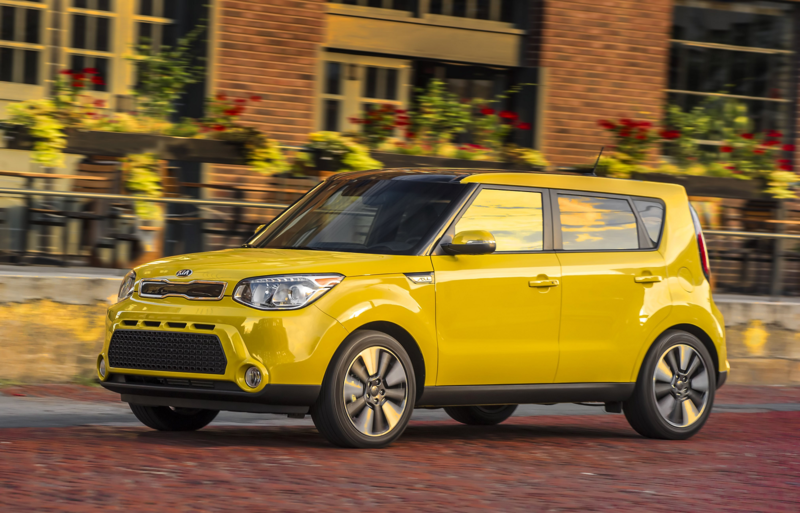 Still waving the square flag, however, is Kia with its Soul.The Soul has always been a top seller for Kia, and for good reason. Where the other boxes felt cheap (though cheerful), the Soul brings style, a solid build quality and tons of features for a wallet-friendly price. 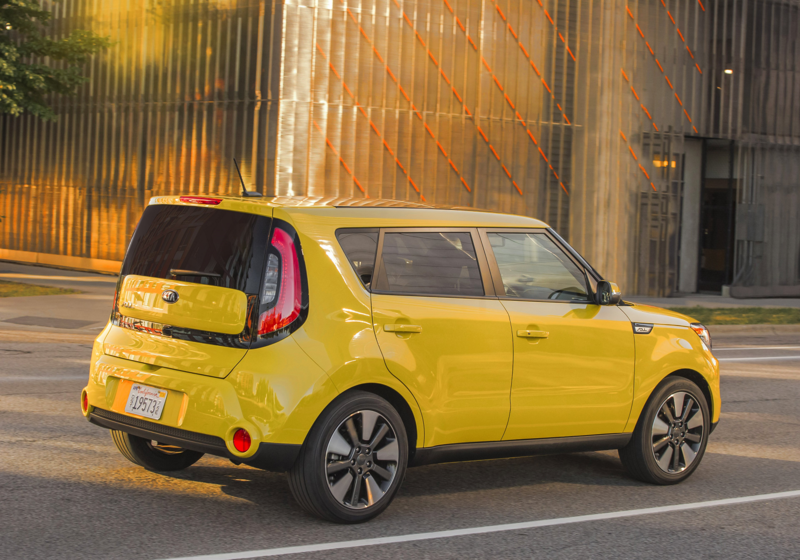 It’s the clear leader in the small box world, and not just because it’s the only one you can still buy new.I recently took a brand-new Kia Soul! (the exclamation point is part of the name – you know, to make it more exciting) from LA to Vegas and back. And even after spending almost 700 miles with the boxy Kia, it’s a car I still find myself stoked on. That said, a freeway cruiser this is not. With its stiff suspension and short wheelbase, the Soul! (shout it out loud as you say it) feels nervous on those high-speed straightaways. It does an admirable job clocking in the miles, but by the time I got to Victorville, I found myself longing for something a little larger—more plush. Something that could soothe the inevitable hangover I’d be fighting during my return trip. Something like a Bentley. Or better yet, an airplane. But whatever… the Soul! is a city car at heart, and it’s a damn good one. With its diminutive size and nimble handling, it easily dodges Vegas’ throngs of meth-addled taxi drivers. A peppy 164-hp 2.0-liter four-banger and not-so-bad CVT provide enough grunt to help Soul! eagerly get from stoplight to stoplight. This powertrain keeps the Kia moving at a reasonable pace on the freeway, too. And with its 31 highway mpg, I didn’t have to fill it up with gas too often, either. Outside, the current gen-two Kia Soul doesn’t look too different from the one that has come before. This newest version is sleek and modern (for a box), featuring stylized alloy wheels, HID lighting, and just the right amount of black-accented trim to provide some contrast. Get one in white, squint really hard and it almost looks like a First Order Stormtrooper. Almost. The inside, though, is where the Kia Soul! really shines. I don’t know what it is about Kia, but the company regularly cranks out interiors superior to that of parent company Hyundai. The plastics look to be of a higher grade, the panels seem to fit together just a hair better, and a whole lot more thought goes into the overall interior design. Things feel just as funky and modern in the Soul! as they do outside. Those cylindrical “pods” housing the speakers and air vents are unique, as is the sound-sensitive accent lighting. When looking at the overall design—including the sculpted surfaces, gloss-black accents, integrated tech, and even the fonts used—this cabin feels very “now.” Whether that means that this will all look dated in the next five-to-ten years remains to be seen. There’s plenty of room for everyone to get comfortable in a Soul!, but if you want to take more than a small bag, you’ll need a second vehicle. Fitting even a moderately small suitcase required the folding down of both rear seats. But at least the front occupants get plenty of comfort with high-end features like heated and cooled leather-trimmed seats, Bluetooth connectivity, full nav, and a backup camera. Yes, there were a lot of optional features on this Kia Soul! tester, so for all I know, a base model could be a total penalty box. But with an as-tested price of approximately $26,000, any adult with a real job can afford a fully spec’d one. Just be smarter than me—use the cash you save to pay your mortgage instead of on a debauchery-fueled trip to Vegas. Speaking of which: Anyone have a couch I can crash on? The interior is thoughtfully redesigned with even higher quality materials than the preceding model and higher levels of craftsmanship throughout. 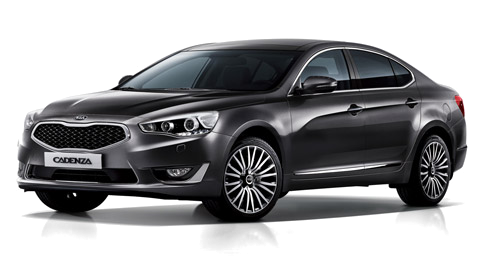 Like the exterior, the Cadenza’s soft interior contours are offset by sheared surfaces. Kia designers visually widened the Cadenza’s interior space with a wraparound dashboard that flows into the door panels and features real stitching. The door panels themselves have been adorned with higher quality soft-touch materials, while soft leather envelopes the Cadenza’s cabin space. Nappa leather is available with quilted seat bolsters accented by diamond shaped stitching that dresses up the Cadenza’s already attractive cabin. For 2017, buyers have greater opportunity to customize their Cadenza, as a dark brown interior color has been added, bringing the total number of color combinations to four. Like the outgoing model, the White Package remains an option, but it has been upgraded with a new black wood-grain-style trim finished with a pearlescent sheen. 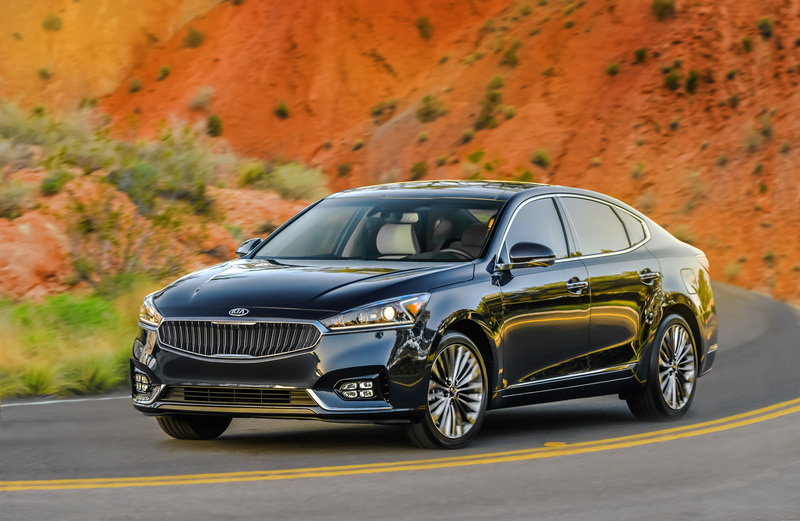 The first Kia to be sold in the U.S. under the DRIVE WISE sub-brand, the Cadenza offers cutting-edge driver assistance features[i] such as Advanced Smart Cruise Control with stop-and-go functionality, Forward Collision Warning and Autonomous Emergency Braking, and Lane Departure Warning. Another Kia first is the Smart Blind Spot Detection System which senses unintentional drifting toward an adjacent vehicle and automatically brakes the opposite side front wheel to help maintain the vehicle’s intended course. Newly designed 18- or 19-inch alloy wheels may be shod with available Michelin®[ii] tires (P245/45R18 or P245/40R19). Behind the wheels, larger brake rotors improve overall braking performance and feel. The front brakes have been increased from 11 to 12 inches, while the rears have grown marginally from 11 to 11.1 inches, helping to reduce stopping distances. Brimming with technology, the cockpit is designed to provide a more harmonious human-machine interface with ergonomically intelligent design, intuitive controls, and a suite of enhanced convenience features making the driving experience enjoyable and effortless. New to the 2017 Cadenza is the Head Up Display (HUD)[iii], which shows key driver information such as speed and turn-by-turn navigation directions on the windshield directly in the driver’s line of sight. In addition, the Surround View Monitor1 has been updated with improved software and resolution that gives the driver a clearer birds-eye view of the area around the vehicle, with newly added reverse guidelines offering confidence when backing into confined spaces. Other features new to the Cadenza include Smart Trunk, which conveniently opens the trunk lid if the sensor detects the key fob for more than three seconds, and a wireless smartphone charger. The latest generation of Kia’s UVO system featuring Android Auto[iv] and Apple® CarPlay[v] is standard, while a 12-speaker Harman/Kardon® system featuring Clari-Fi™[vi] music restoration technology is an option. 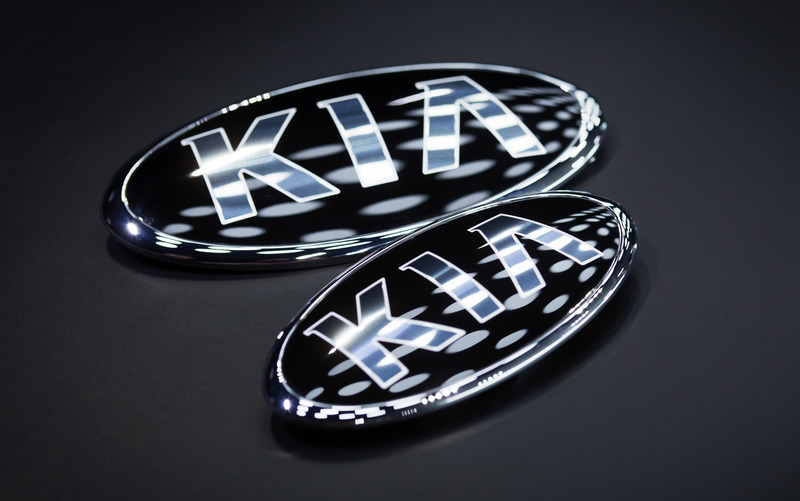 Kia Motors Corporation and Total Lubrifiants recently renewed their strategic partnership agreement. 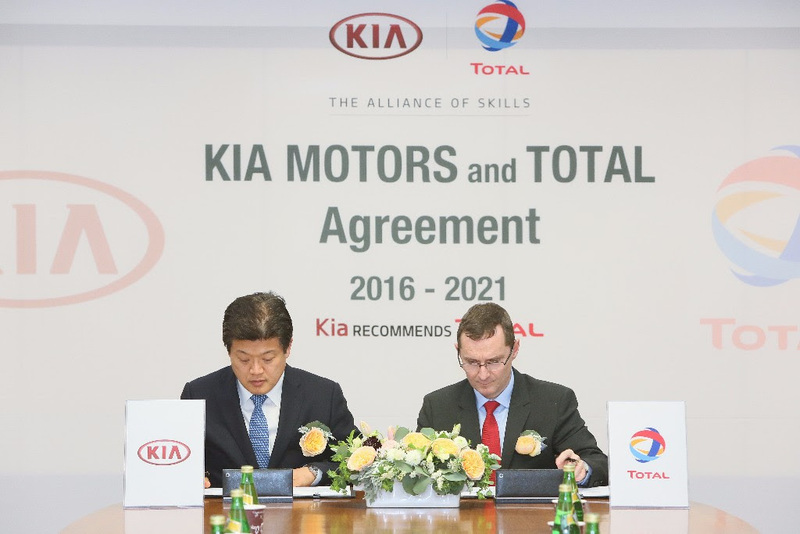 For another 5 years, Total will remain Kia Motors Corporation’s preferred aftermarket lubricants supplier for Kia vehicles. Total branded automotive lubricants will be exclusively recommended and available to customers across Kia’s service network of more than 5,500 dealers in around 180 countries, including West European markets from January 1, 2017. 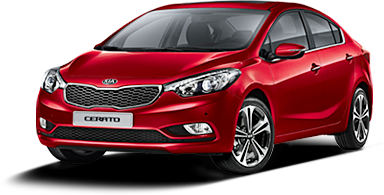 The extension of the initial cooperation, first started in 2011, extend benefits to all Kia vehicles owners and Kia dealers. 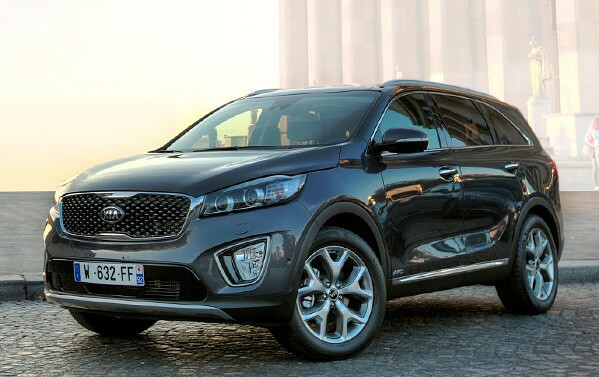 The Kia networks will receive access to high-performance Total Quartz engine oils, specifically developed to optimize the performance and reliability of Kia engines while also offering improved fuel economy benefits. 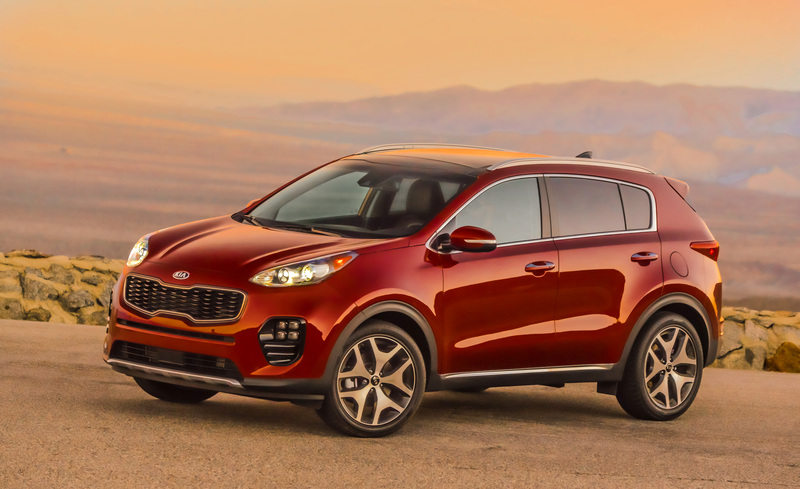 Kia and Total will also develop joint marketing service programs aimed at increasing Kia dealers’ profitability, customer retention and customer satisfaction. Photo caption: Steven Yoon, Vice President, Overseas Service Division at Kia Motors Corp. (left) and Pierre Duhot, General Manager, Automotive Division at Total Lubrifiants (right) take part in the official signing ceremony for the 5-year partnership extension.